Sometimes things are easier than they seem. Predicting job performance is one of those things. The 2X2 matrix shown below is proof. In just 50 words, it describes exactly what you need to do to make better hiring decisions and what you need to do to avoid the bad ones. The understanding starts by looking at how people who are very competent and highly motivated to do the work actually get hired. This is the Top-Tier group 1 in the upper left grid of the matrix. These are people who are both very competent and highly motivated. They are considered outstanding because they produce more high quality work on a more consistent basis. People like these are hired when they see the job as a true career move combined with an equitable compensation package. In this case a career move needs to offer a minimum 30% non-monetary increase. This is the difference between the person’s current career trajectory and the potential one offered by the new job. This 30% is the collective sum of a bigger job combined with more satisfying work, more impactful work and faster growth. While it takes extra time to prove this, few hiring managers are willing to make the investment in time despite the obvious advantages. While these people are fully competent they’re not consistently motivated to do the required work for one reason or another. As a result their work quality suffers or they need extra pushing to meet minimum requirements. 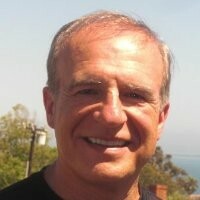 Hiring good people who underperform is a very common problem. Not only is it totally predictable; it’s also totally avoidable. Two problems are the typical cause. One is an emphasis on short-term non-job related criteria when the offer was made or a rushed process. The other is a lack of fit in some way with either the job or the manager. When the hiring process is rushed or the emphasis is on what a person gets on the day he/she starts (title, compensation, and location) serious problems are likely to occur. In many cases the best people are filtered out too soon on this criteria or sometimes these factors drive the negotiation process. On the “bad fit” side it could be that the person is not motivated to do the work since it wasn’t fully clarified upfront or it’s not very inspiring work. Sometimes good people don’t get along with their manager and this friction causes dissatisfaction and turnover. Sometimes these people don’t fit with the culture or the team. Regardless of the cause, lack of fit is usually the problem when otherwise talented people fall short of expectations. The solution starts by clarifying job expectations upfront, fully understanding what motivates these people to perform at peak levels and making sure the fit factors are considered before an offer is considered. 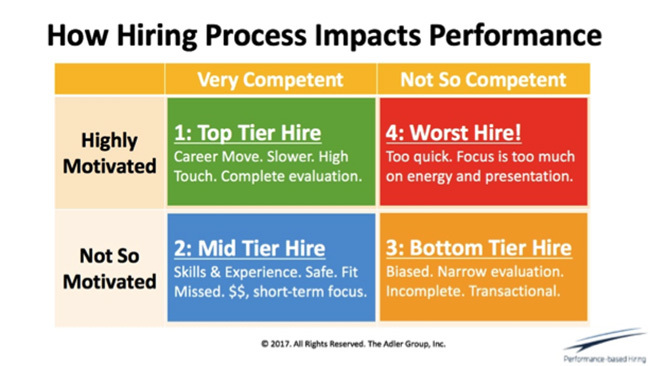 When this is combined with a recruiting and negotiating process that balances long-term growth with short-term needs it’s relatively easy to shift every potential Tier 2 average hire into a Tier 1 top performer. If Tier 3 type candidates represent over a third of the workforce or the problem is isolated to a department or region, major changes are essential. Often these involve a major shift in talent strategy combined with a rethinking of the entire hiring process. Tier 4: Not competent but highly motivated. Highly motivated incompetent people are the worst of all hires. These are the people who mess up things so quickly you don’t have the chance to recover. Avoid these hires at all costs! Typically these people are hired when the manager is desperate and the people chosen have lots of enthusiasm and make great presentations. This is a sure recipe for making bad hiring decisions. Hiring Tier 1 top performing people on a consistent basis is pretty straightforward. It starts by understanding this simple truth: Whether you’re the hiring manager, recruiter or prospect, don’t make long-term decisions using short-term information. While implementing this simple truth is not simple, it is the truth and too many recruiters, hiring managers and candidates consistently ignore it.